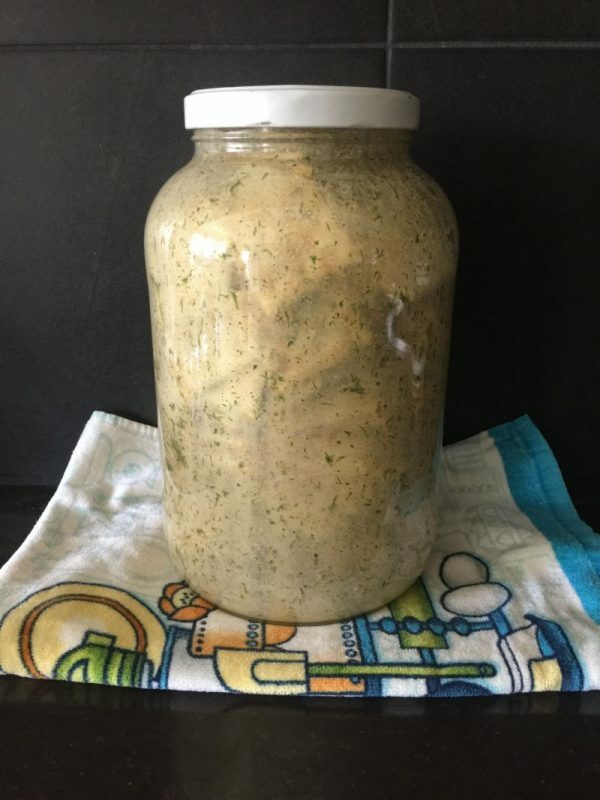 I went back and browsed through the recipes and cooking tips I have shared on this post, and I was amazed that this will be #14. That means that I have been doing this over 3 months, and my how the time has flown! 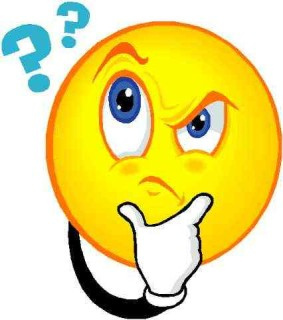 At my house, it is not uncommon to hear someone say “wow! This is BLOG WORTHY!” which I receive as a fine compliment. However, it also means that I spend a lot of time taking pictures of practically everything I do, just in case I need it for a blog post. California Girl puts the actual post together. 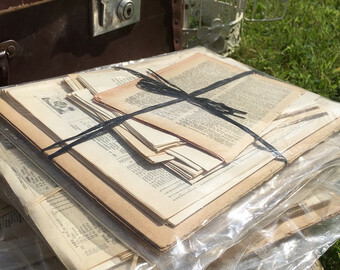 I submit a typed “blog” to her, which she looks over and adds her own comments, and then she selects photographs to go with the post from an assortment of pictures that I send her. It’s always a surprise to me what the post looks like each week, and I look forward to seeing it at the same time as all of you. 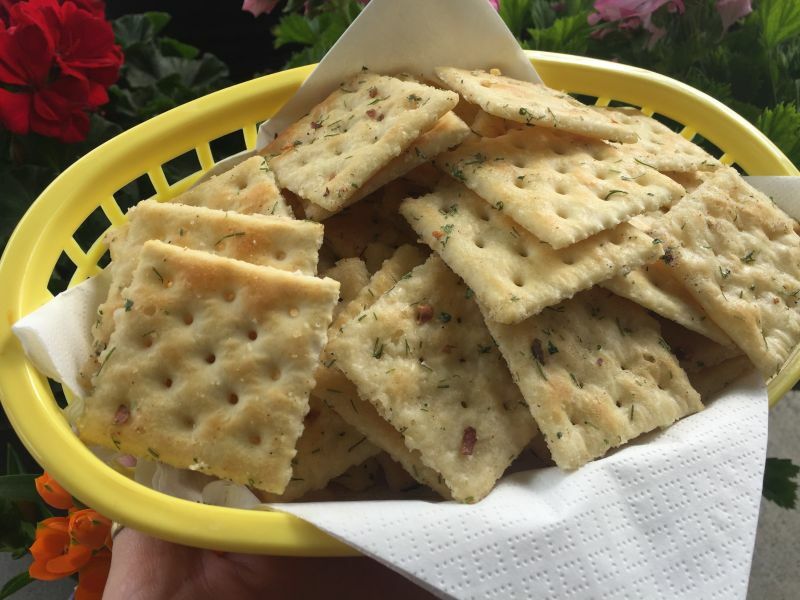 California Girl comments: When Ms. April first approached me about these crackers I paused. I honestly still can’t wrap my head around how the crackers stay crispy when they have been marinated in liquid. Still, she assures me that they are amazing so I believe her. I can’t wait to get home and try these little beauties out. They sound like they will be a perfect addition to my entertaining crackers. Yummy. Before you decide you aren’t going to try this, let me tell you that you are doing yourself and your family a disservice if you don’t try them. They are easy, and you can change them up as you like…and they are so good you won’t be able to stop eating them. 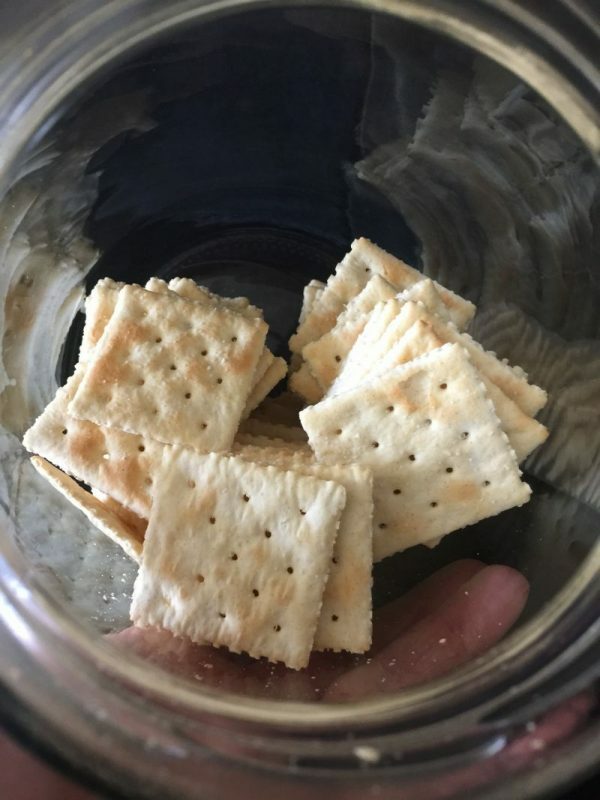 In fact, I had to make a second jar this week so I could have a picture of the finished product because when I went to get the jar out of the pantry to photograph, there were only 4 crackers left in the bottom of the jar. Kaydence, my granddaughter, had discovered them and finished off the entire gallon jug in just two days while watching iCarly after school. 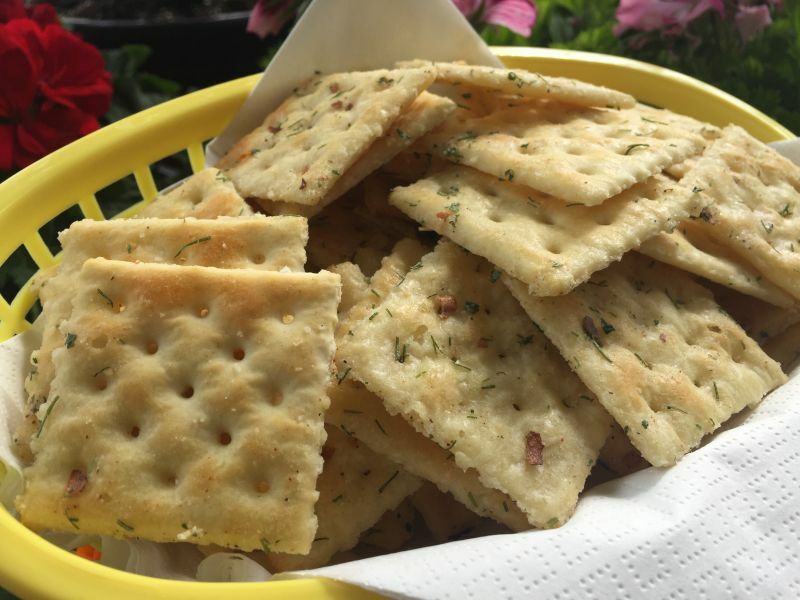 These crackers are perfect to take to a party, or serve up while watching the big game, or just when friends come over. Seriously, your friends will ask you to bring them again and again. 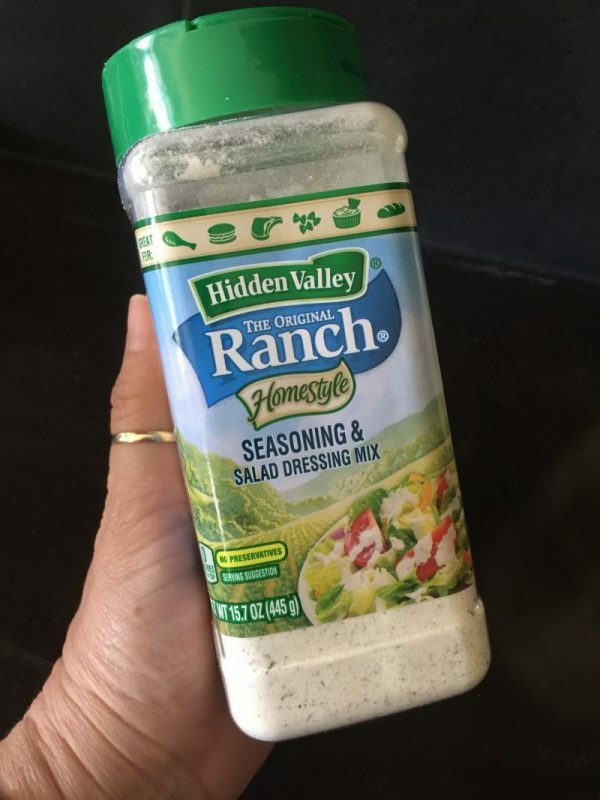 **1 TBSP dried oregano, 1 tsp garlic powder & 3 TBSP grated parmesan cheese (the dry stuff in the carton). 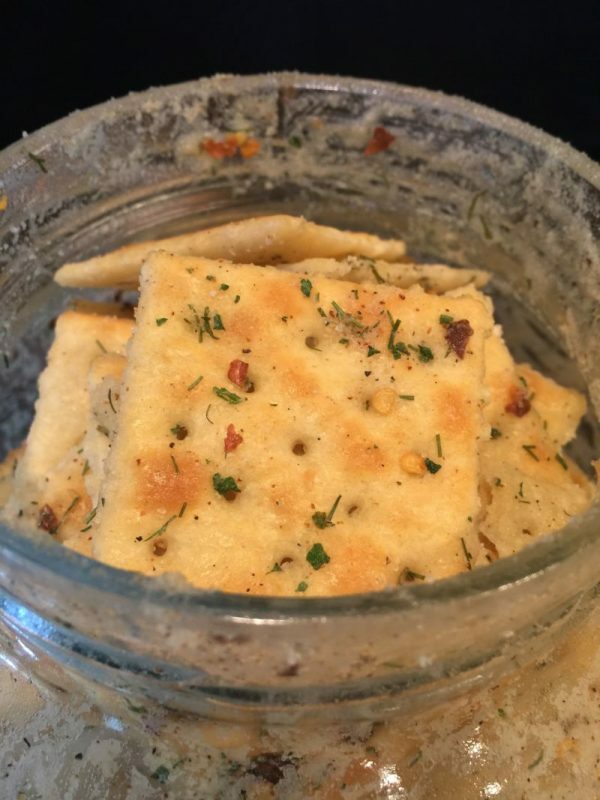 Don’t add the parmesan to the oil, but sprinkle 1 TBSP over the crackers each time you pour the mixture over the crackers in the jar. **make up your own combinations! Hopefully, My pictures will clearly show you how it’s done. It’s easy and will take you 5 minutes. 1. 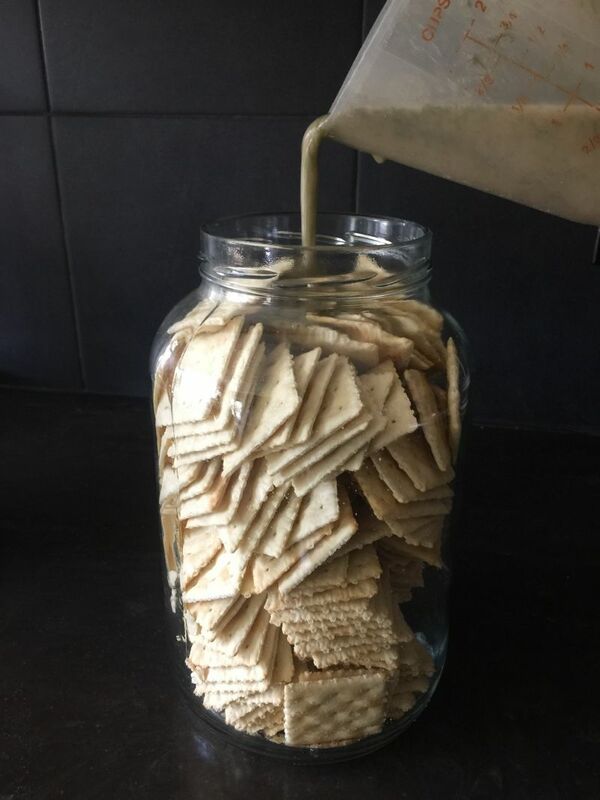 Carefully stack the crackers horizontally in 4 stacks on the bottom of the glass gallon jug so that it is 1/3 full. 4. Stack the remaining crackers in the jar and repeat the oil process. 5. 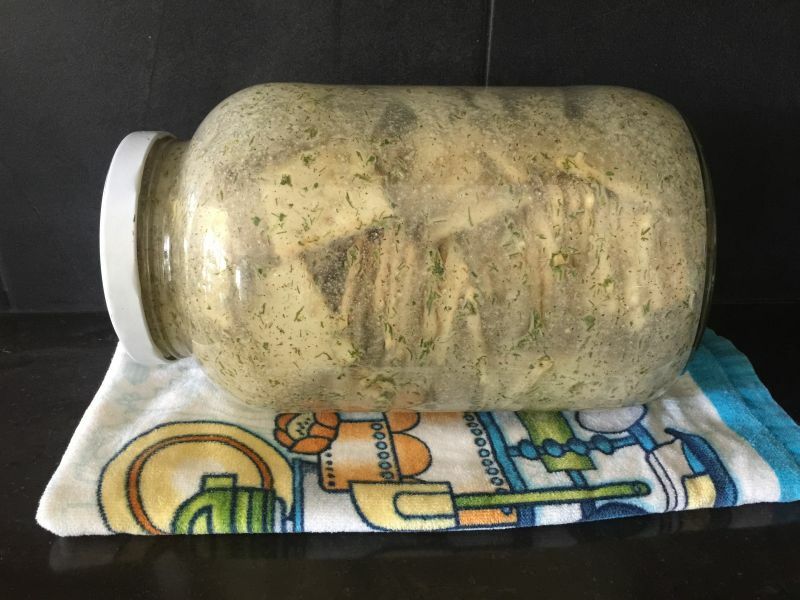 Put the lid snugly on the jar and lay the jar carefully on the counter or table and roll gently to distribute the oil mixture through the crackers. Be gentle. You don’t want to break the crackers. 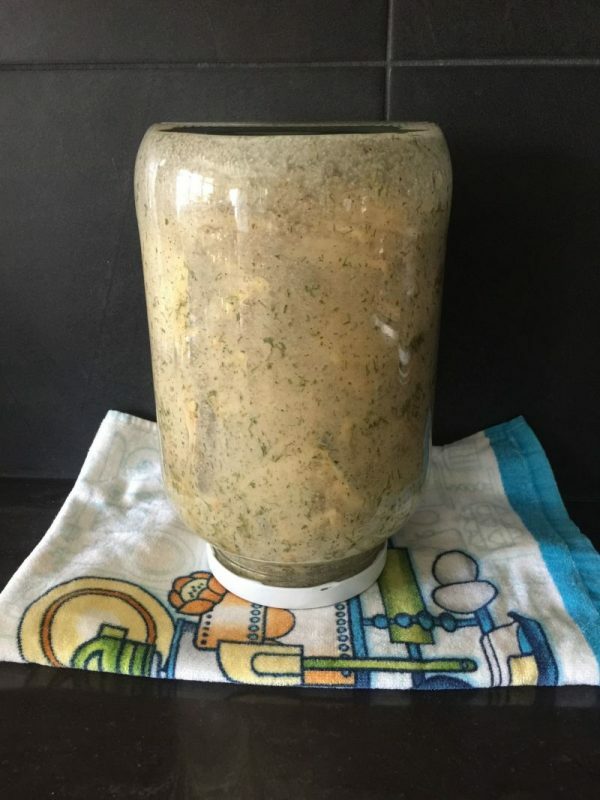 Place the jar on a folded dishtowel so that it doesn’t roll away, and leave on the counter. 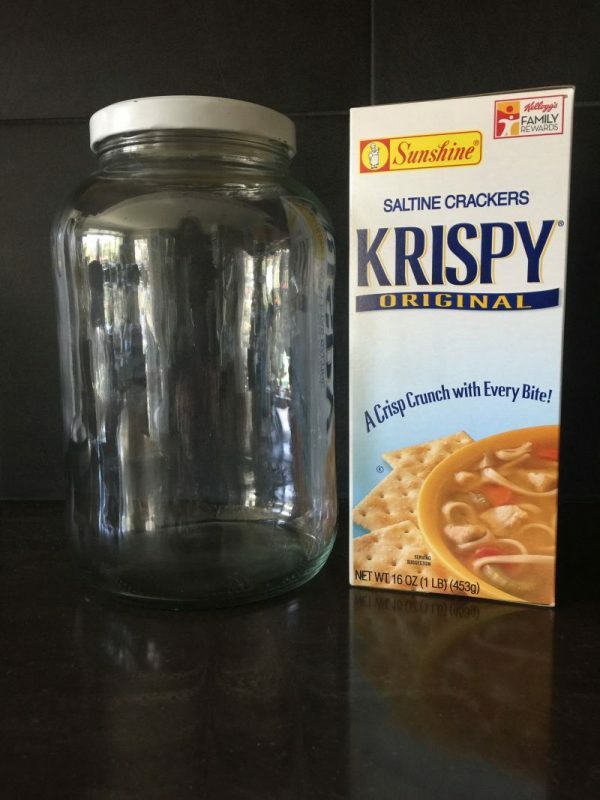 Every 20-30 minutes, roll the jar over to a new position so that the oil runs through the crackers. Eventually, you won’t see the oil moving much at all. This is normal. Do this throughout the day. 6. Throughout Day 2, every time you come through the kitchen, turn the jar over. 7. 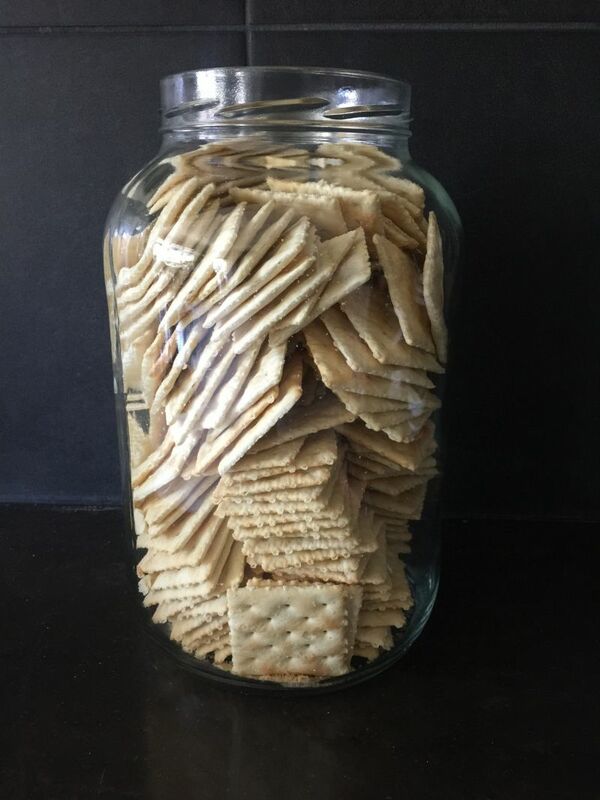 Day 3 – The crackers have now been in the jar for 2 full days. Open and enjoy.